Every time I return from a holiday I feel this unexplainable urge to remodel or redecorate the house. Nothing big, just the desire to bring in another look and feel by changing some accents, like pillows, candles or throws. Now that I am spending more and more time in our home office as a freelance blogger, I’d better use the benefit of being independent and make my work space the way it suits me best! 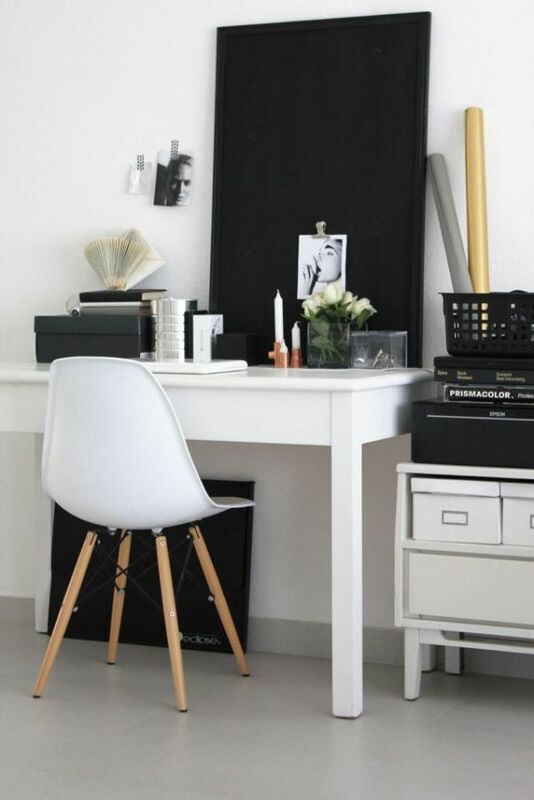 When searching the web for some beautiful work spaces, I found a lot of inspiring and bright ones in black and white. Not the combination that would work for me, as I have a weakness for natural materials and Nordic blue, greyish colors (click here for a my style example), but I love how the use of black and white creates a neutral, well balanced place that leaves enough room to let your creativity flow endlessly. To add some personality, you easily create your own mood board by putting together inspiring pictures, illustrations or objects, and by framing motivational printables for example. I found some great ones that I will share with you shortly. I promise they will fit your black and white work space perfectly and will get you going! Glad you liked it Diane!